Jared Bednar played and coached in the ECHL for almost 15 years, trying to reach the AHL. Once he hit that level last season, his upward mobility accelerated quickly. Bednar was named head coach of the Peoria Rivermen earlier this week. The move comes after just one season coaching in the league, working as an assistant for Abbotsford in 2009-2010. "Everyone has a little bit of a different path," said Bednar, 38. "For me, it feels like a long time to get where I'm at. Every season comes on its own. It brings its different challenges. I feel like I'm right where I want to be. I think I've worked hard to prove myself as a coach." Bednar's results have been consistent as a player and a coach, and they are the type that organizations looking for leaders like to see. He was the first person in ECHL history to win the Kelly Cup on three separate occasions, two as a player with South Carolina and one as the Stingrays' head coach. 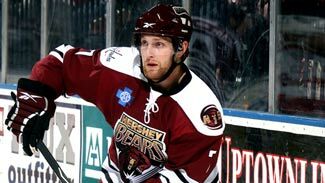 During his tenure with the team, he coached 11 players who went on to be a part of one or both of the Hershey Bears' Calder Cup championships in 2009 and 2010. In his one season with the Heat, he helped the team upset Rochester in the first round of the AHL playoffs. "Everyone has a little bit of a different path. For me, it feels like a long time to get where I'm at. Every season comes on its own. It brings its different challenges. I feel like I'm right where I want to be. I think I've worked hard to prove myself as a coach." "I like to take a lot of things into consideration," he said of his coaching style. "I put a lot of emphasis on team defense. Nowadays, you have to pursue the puck, be an up-tempo (team). I like to give our guys a little bit of freedom in that regard." But even winners have to squirm a little bit. Bednar said he interviewed with St. Louis two weekends ago, took some follow-up questions on the phone and then had to wait one very long week while the Blues decided whether he was their man. "There was a little bit of anxiousness the last week or so. The more I looked into the job, the more I wanted it," he said. "Then you have to wait and see if you are the right fit for the organization. It's been a busy last couple of weeks. It's about to get even busier. I think it's a great organization. It should be a lot of fun." MacKenzie's inside track -- When forward Derek MacKenzie was a free agent three years ago, he came close to signing a deal with Vancouver. That would have put him in line to play for then-Manitoba coach Scott Arniel, apparently a fan of his game. Instead, MacKenzie signed with Columbus. But now he has another chance to impress Arniel, and he doesn't even have to move to another organization to do it. MacKenzie has agreed to a two-year, two-way contract with the Blue Jackets. That's the same team that just hired Arniel as its new head coach. "I'd like to think the whole organization there likes me and wanted me," MacKenzie said. "I think they landed a great coach up there. Hopefully, it filters down to whoever's in the organization." The Calder Cup is staying in Hershey. The Bears became the AHL's first repeat champions in 19 years, capping a comeback from a 2-0 series deficit with a 4-0 victory over the Texas Stars. That flux is one reason that the Blue Jackets were so keen on keeping MacKenzie, 29, in the fold. Columbus is switching affiliates from Syracuse to Springfield this season. MacKenzie was the captain of the Crunch this year, contributing 17 goals and 30 assists in 47 games. The Blue Jackets will likely stitch the "C" on his sweater for some continuity if it looks like he'll see a large chunk of games with the Falcons. That plan isn't on MacKenzie's radar now, naturally. He skated in 18 games with Columbus last season, his most in three seasons with the organization. He said he seriously pondered taking a fatter deal in Europe, but thought pursuing what could finally be a breakthrough opportunity with the Blue Jackets was a better choice. "I just think that Columbus stepped up and made it difficult for me to say no. Me and my family didn't want to switch organizations," he said. "I think it's only human to think the grass is greener on the other side, should I wait to July 1 (and be a free agent). I think Columbus is a fit for me." Devils back in Albany -- A new era of hockey in Albany is beginning with the return of a familiar business partner. The New Jersey Devils announced last week that they are moving their AHL franchise from Lowell to Albany starting in 2010-11. The deal bridges the gap in what could have been a hockey hiatus for the city. Carolina was the River Rats' parent club the past four seasons, but is relocating to Charlotte this season. That allowed New Jersey to jump in and create the Albany Devils. New Jersey was the affiliate of the River Rats for 13 years from 1993-2006, winning four division championships and the Calder Cup in 1995. But the Albany-New Jersey relationship soured in its second half. Albany's record in the last seven years of that stretch was 174-330-56, prompting the Rats to end the affiliation and look for a new partner. 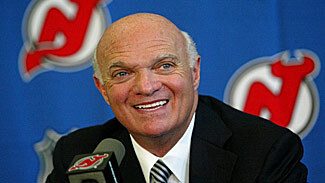 "Winning is always a priority," New Jersey President Lou Lamoriello told the Albany Times-Union. "The most important thing is developing (players for the NHL), but winning is important in developing, so the players have the positive experience. We didn't have success for a period of years in that category. Our team last year was one of the better teams (39-31-4-6). Then I had some call-ups because of injuries, but there will be an outstanding hockey team in Albany, and we're expecting to win there." Around the AHL -- By beating the Texas Stars in the Calder Cup finals, 4-2, the Hershey Bears become the first team to repeat as Calder Cup champions since 1991, winning the title for the third time in the last five years and extending their own league record with their 11th overall championship. … Hershey was the first team in AHL history to win the Calder Cup after losing the first two games of the finals series on home ice. The Bears also set a record with eight overtime victories during the 2010 postseason. … Attendance at Giant Center for Game 6 on June 14 was a franchise-record 11,002. …Hershey's Alexandre Giroux extended his own AHL record with his fifth career overtime playoff goal to win Game 5. … Hershey (8-0) and Texas (6-2) were a combined 14-2 on home ice during this postseason entering the finals. Through the first five games of the championship series, the Bears were 0-2 at home while the Stars went 0-3. … Anaheim has named Mike Stapleton its assistant coach in new affiliate Syracuse. Stapleton, 44, comes to the Crunch after spending the last four years as either an assistant coach or associate coach in the Ontario Hockey League with Sault Ste. Marie (2008-10) and Erie (2006-08). Stapleton played in 697 NHL games and is the son of former NHLer Pat Stapleton. … Dallas has signed Texas goaltender Brent Krahn to a one-year, two-way contract extension. …The Chicago Wolves have named Mike Gordon their new president. Gordon joined the Wolves as vice president of partnerships in February 2009. Under his direction, the Wolves set franchise records in both corporate revenue and number of corporate partnerships during the 2009-10 season, which included seeing corporate involvement increase by 24 percent.